Hundreds of youngsters, family members and pets, filled the Caterpillar Playground area of Willow Creek Park for the April 14 Willow Creek Easter Egg Hunt. The 1 p.m. event was sponsored by the Willow Creek Women’s Club and Juhi Johnson with RE/MAX Professionals. Sunshine and warm spring temperatures made for comfortable candy collecting, although once the signal to begin was given the candy didn’t stand a chance. It only took a few minutes for scrambling kids to locate and gather the candy. Even the Easter Bunny was there, greeting everyone and posing for photos. Thank you to the sponsors and all the volunteers for their work on this special event. The Willow Creek 3 Dolphins youth swim team is for all abilities and levels with an emphasis on learning to swim better. Competitions are a sort of measuring stick to gauge personal accomplishments. There are a handful of year-round swimmers, but the large majority of the team is kids having fun for the first part of the summer. The team is open to kids ages 4 to18. For the younger swimmers, the coaches request that the kids are comfortable in the water. The season starts mid-May and ends mid-July. Practices are held in the afternoon in May. Once school is out, practices move to the morning from 7:30 a.m. to 10:45 a.m. Swimmers are grouped by ability more than age. You can register for the team through Tuesday, April 30 (last day to get official Dolphins gear). 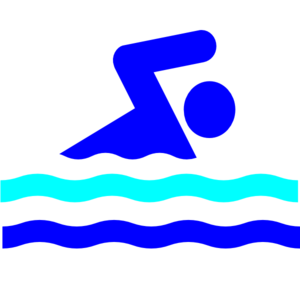 The swim team is open to resident and non-resident swimmers. For more information, check the team website, www.wc3dolphins.com . This information may be old news for some long-time Willow Creek 3 residents and new to others. In either case, it’s worth at least briefly repeating. According to the Colorado Department of Parks and Wildlife, the months of February and March are the coyote breeding season in our region. Pups are then born within 60 days. That means coyotes may be especially protective of their mates, dens, pups and food sources now and through early summer. 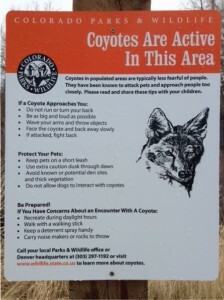 There have been recent coyote sightings on the Willow Creek Trail along the park as well as other areas throughout the Willow Creek community. Although coyotes are rarely a threat to humans, that’s not the case for our pets. Parks and Wildlife recommends cats be kept indoors and dogs be kenneled or kept on a short leash while being walked. Remember – a six-foot privacy fence is not a barrier for a coyote. Click here for the digital edition of the May Willow Works newsletter. It can also be located by clicking on the Minutes/Newsletter drop-down under the HOA heading on this Home page. The print edition should be in residents’ mailboxes in early May…The Willow Creek 3 Dolphins youth swim team is looking for sponsors for the 2019 summer swim team season. If you own a small business and would like to participate, email fundraising@wc3dolphins.com to receive a sponsorship packet. Sponsorships with the team allows for unique and exclusive access to the parents within Willow Creek 3 as well as surrounding areas. The swim team seasons runs for 10 weeks, with the swimmers and parents at the pool six days a week…The Willow Creek Women’s Club is run by a board of volunteers who meet once a month to plan monthly programs to bring women of Willow Creek together, strengthen the sense of community and benefit the neighborhood as a whole. Each year the Women’s Club needs new board members. If you would like to volunteer for the roles of Daytime President, Secretary, Treasurer or Public Relations, contact Carolyn Pyron at 303 912-6628, or email her at pyroncarolyn@yahoo.com. 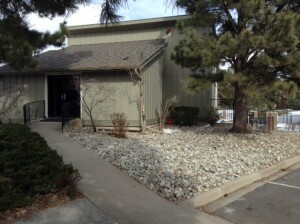 Clubhouse fee $35/day, $100 deposit. Need to complete rental agreement. WC3 landscape and greenbelt maintenance. Organizes and promotes tennis activities for all three Willow Creek communities. The ACSO provides police services under contract with the city of Centennial. Available 24/7 to answer questions and direct you where to go for help. Classes offered by this organization include: CPR, Driver Awareness, Teen Crash Avoidance, Super Sitting Babysitting. They also do child card seat inspections. • Nextdoor.com: A free social network serving neighbors and the community. Monitored locally by Willow Creek residents.